Low Cost Prefab Homes Nigeria - Low Cost Portable Homes. Cut Cost Drastically! Low Cost Prefab Homes Nigeria - Low Cost Portable Homes And Portacabins. Looking for low cost prefab homes? The good news is . . . when you choose to buy portable homes or portable cabins from us, we give you options that enable you to spend less and get value for your money. Yes, we offer low cost prefab homes! The cost of any house . . . whether prefab building, block building, or brick building . . . vary from building project to building project. This means that even though two houses may look exactly the same on the outside, the cost may vary widely depending on a number of factors. So, if you want low cost portable homes, you will get exactly that because we have portable homes and portacabin specifications developed to ensure our clients get great value even with a low budget. Even if you come to us without any specifications in mind, we will provide you our standard portable home designs and give you the opportunity to choose from the variety of low cost prefab homes we manufacture and sell. Click HERE to request a quote and get our standard price list. In the prefab homes business, there are usually two broad categories of customers. 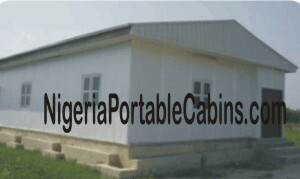 This section of the Nigeria Portable Cabins and prefabricated buildings web site address category 1 customers. That is, customers on a budget looking for low cost prefab homes. In simple words . . . some clients want low cost portable homes and portable cabins while some want everything they desire built into the prefab home irrespective of the cost. We serve both category of customers and we give them equal treatment because every customer is important to us . . . including YOU. Low Cost Portable Homes - How? Now the big question: What elements (or attributes) of a portable home have the potential to reduce its price to meet the needs of low cost prefab home customers?
. . . and a few other factors. In summary, you can either order a small prefab home, a prefab luxury home, or something in-between. The decision you make, will determine if the price of the prefab building you buy will be low cost, medium cost, or high cost. If you want low cost prefab steel buildings, then you should choose the set of specifications that will significantly reduce the cost of your new portable home and achieve your dream of buying low cost prefab home. 1. The smaller, the better. For example, a 6 metre by 3 metre prefab home cost less than a 9 metre by 3 metre prefab home. Choose a smaller building if you're tight on budget. 2. Reduce the number of walls. More walls introduces additional cost in terms wall material and erection cost. More walls also means more doors and more windows. And all of this adds up to a higher cost. For example, a 9 metre by 3 metres 3 rooms portacabin will cost more than a 9 metre open office portacabin. 3. Bathroom & Toilet: Merge the bathroom and toilet into one room. Separating them requires additional walls and additional cost. 4. Order a retangular type prefab home if you're short on cash. Retangular type homes cost less than elaborate multi-dimensional homes. 5. Kitchen Or Kitchennete: You can request a small kitchennette or a large kitchen . . . your choice. But be informed that a kitchennete reduces the cost of your portable home while a large-size kitchen cost more money. 6. Bed Size: Your bed size can be 6 feet by 6 feet, 6 feet by 4 feet, or something smaller. The bigger the bed you use, the bigger the space it will occupy and, hence, the bigger the portable cabin or portable home will be. A 6 feet by 4 feet bed is alright for a low cost prefab home. 7. Interior Wall Finish - We offer two types of PolyUrethane insulated wall finish; a) Steel interior finish and b) MDF plywood interior finish. Steel is obviously more expensive than wood. If you're on budget and need low cost portable homes, we recommend you choose wood interior finish. This will reduce your cost by about 15 to 20%. The steel interior finish is called PU200 while the wood interior finish is called MB200 in the metal building cost comparison section. Checkout the price difference and you will be amazed. Ready to buy low cost prefab homes?